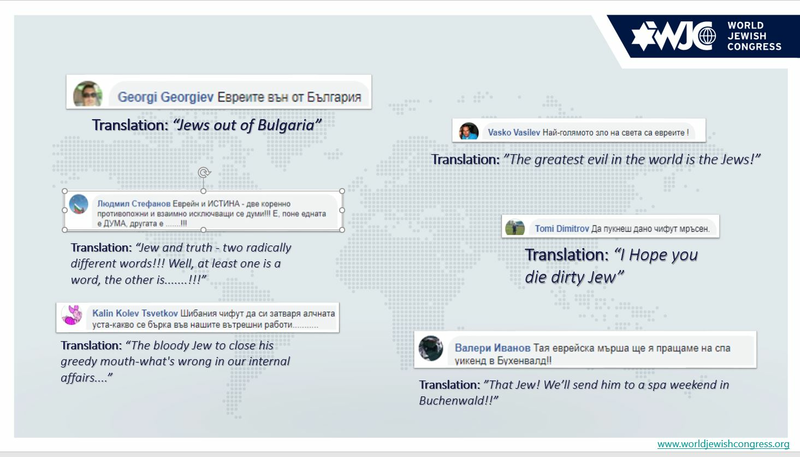 NEW YORK – The World Jewish Congress released a detailed report on Monday exposing the undeniably antisemitic language used on social media by the ultra-nationalist promoters and participants of the Lukov March in Bulgaria, a torch-lit demonstration that draws neo-Nazis from across Europe to the capital Sofia each February in honor of General Hristo Lukov, a Nazi collaborator whose movement sent 11,300 Jews to their deaths in the Nazi death camp of Treblinka. The organizers of the march claim not to be antisemitic, but the comments left on its official Facebook page indicate a clear proliferation of Jew-hatred among its supporters against the Bulgarian Jewish community and the Jewish world at large. One such Facebook post by the organizers, reacting to the WJC efforts in 2018 to stop the march, targeted CEO Executive Vice President Robert Singer, using age-old antisemitic tropes: “No mister, with a name of a brand of sewing machines, the problem of Bulgaria is not Lukovmarch. The problem is that there are people with too long noses like you, who are burning with desire, snooping where they do not belong. But be sure that whatever you do, General. Lukov will receive a worthy honor from the Bulgarian youth!” read the post. Other posts and comments in recent years paint a similar picture. “The World Jewish Congress will do everything it can to work with Bulgarian authorities to minimize the damage of the Lukov March and other glorification of the antisemitic ideology that brought about the near destruction of European Jewry. We are grateful to the Bulgarian government for its declarations of opposition to this abominable demonstration. They are on the right side of history and it is our deepest hope that the Bulgarian parliament will enact the necessary legislative measures to ban such rallies in the future,” Singer said. “We also urge Facebook and other social media platforms to continue to step up and crack down on the intolerable and hateful rhetoric spreading on extremist pages. We will do our part to work to monitor and remove offensive and antisemitic material such as this post from the internet, in our efforts to help make the digital world a safe space for all,” Singer said. Dr Alexander Oscar, President of the Organization of the Jews in Bulgaria Shalom, said: "Our most important task right now is to create awareness in the Bulgarian society why Lukov March has no place in Sofia. The ideas promoted by the march supporters are outright anti-democratic. We cannot pretend anymore that calls for racial purity and white supremacy are freedom of speech. They are not. They are hate speech, they incite division in the society, they create atmosphere of fear and uncertainty in minorities. Bulgarian Jews and minorities of any other backgrounds deserve to feel safe in our hometown. In our own country." Last year, the WJC secured more than 180,000 signatures from around the world on a petition urging the Bulgarian government to issue an administrative ban against the event, which continues each year despite efforts to prohibit it.